Pigs possess complex ethological traits similar to dogs and chimpanzees. Pigs’ ability to tell each other apart forms the basis for all their social relationships and provides evidence that they are as socially complex as other intelligent animals, including primates. If you visit Nikki, one of the domestic pigs who lives at Farm Sanctuary’s 175-acre shelter in Watkins Glen, New York, you can expect her loud voice to announce your arrival. Nikki is gregarious and quick to socialize with human visitors. Don’t take it personally, however, if she keeps you at bay from her babies. She has good reason to be wary of strangers. Prior to her rescue, Nikki escaped from a gestation crate during the record-breaking flood of the Cedar River in Cedar Rapids, Iowa in June, 2008. Shortly thereafter, Nikki gave birth to a litter of piglets. Displaced and alone, Nikki protected and nursed her newborns despite her stress, exhaustion, and hunger. Now, years after that traumatic experience, Nikki continues to be inseparable from her piglets and extremely protective of them. Rose, another mother pig, also escaped from a gestation crate during the Iowa flood. Unlike Nikki, however, Rose suffered the loss of her offspring. After her relocation to the Watkins Glen shelter, Rose exhibited signs of depression. She refused to eat. She ignored her fellow pigs’ attempts to cheer her with invitations to play. Shelter workers had to feed her with a syringe. Observing that Rose was showing interest in Nikki’s interaction with her latest litter, workers moved Rose into a pen with Nikki. Rose began to help care for Nikki’s young ones, and Nikki, the normally cautious, vigilant mother, readily allowed Rose’s assistance. Gradually, Rose began to eat on her own. And with the combined attention of two nurturing adults, Nikki’s piglets flourished. One piglet in particular, a female named Rory, became Rose’s closest companion. 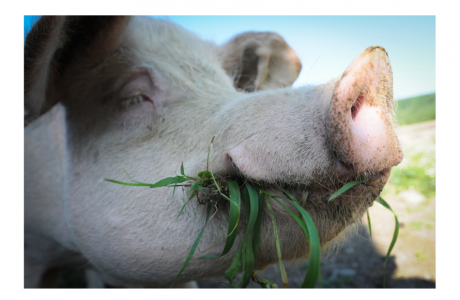 Although Rose never displayed the adventurousness of some of her fellows, her recovery shows the importance of social interaction, what we might call friendship, to pigs’ psychological health. The story of Nikki and Rose is more than an inspiring anecdote. Earlier this year in the International Journal of Comparative Psychology, we published the findings of a comparative review we conducted of all the major peer-reviewed journals that have published research papers on pig cognition, emotion, self-awareness, personality, and social complexity. We also conducted a complete search of the websites of the major authors in these fields for all of their relevant projects. Finally, to ensure that our search was comprehensive, we examined the reference section of each paper to find additional articles in miscellaneous journals. We did not place time restrictions on when articles had been published, but we did give priority to more recent papers when appropriate. Our review was a thorough but not exhaustive analysis of all studies of cognition and emotion in pigs. We chose to focus on the more complex capacities in pigs that are arguably at the leading edge of intelligence and sentience. We also identified compelling and promising areas of cognition, emotion, and sociality that we hope will be investigated in future studies. Our review has put the available research on pigs into a comparative framework that enables us to see how the results of studies on pigs relate to or differ from the results of tests on other animals such as chimpanzees and dogs. 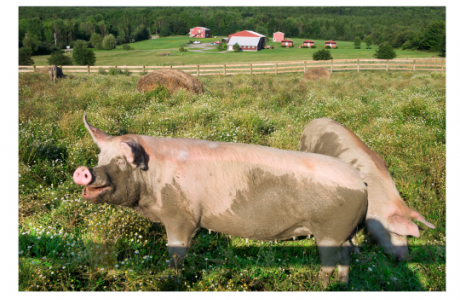 Our findings suggest very strongly that pigs deserve inclusion in the “smart” animal club. Pigs live in complex social communities, they love to play, and they recognize each other as individuals. They are adept at solving mazes and other tests involving object location, and they can recognize a simple symbolic language. They have excellent long-term memories. As the interaction between Nikki and Rose demonstrates, pigs feel a range of emotions, and they respond to each other’s emotional states. 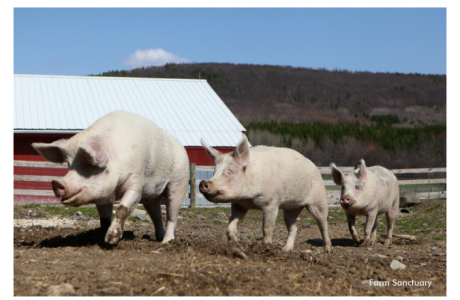 Nikki (pictured left) is one of the domestic pigs that escaped from a gestation crate and now lives at Farm Sanctuary’s Watkins Glen, New York shelter. Domestic pigs are highly social animals, and Nikki and her companions are no exception. Pigs’ evolutionary history holds one of the keys for interpreting current research on their capacities. As with all domestic animals, many species-specific traits have their origins in the traits of wild ancestors. Domestic pigs descended from wild boars (Sus scrofa), a gregarious species that underwent the first phase of domestication in the Near East about 9,000 years ago. Multiple smaller domestication events occurred over time, with much crossbreeding between Asian and European pigs, until the species we now recognize as Sus domesticus eventually emerged. In considering the history of domestic pigs, one should remember the particular set of physical and behavioral traits for which they were selectively bred. Domestic dogs were selected for traits that promoted human companionship and work. Pigs were selected for traits that promoted growth and reproduction. Pig domestication did involve some artificial selection for temperament to make pigs easier to manage when kept in close proximity to humans. 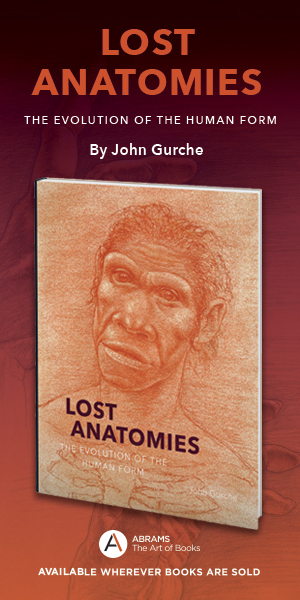 Primarily, though, they were domesticated to serve as a food source. Consequently, their cognitive and behavioral capacities remained relatively unchanged from their wild forbears. In settings that vary widely in terms of comparative freedom and restraint, domestic pigs express many of the instincts, motivations, and sensory abilities that enable wild boars to survive. Likewise, both species show signs of distress in highly artificial settings. It should come as no surprise—considering the gregarious nature of their wild counterparts—that pigs are highly social animals. For both domesticated pigs and wild boars, the basic social unit is several females and their offspring, with strong parallels in reproductive behavior, parenting, and development. Tactile information plays an important role in their behavior. The highest density of tactile receptors is found in their snout, which they use to root, carry, and push items, and to interact with each other. Olfaction is the pig’s keenest sense. They can identify fellow pigs, determine each other’s state of sexual arousal, and even detect each other’s emotions during aggressive encounters. In social contexts, pigs also use their sense of hearing. Mother pigs and their offspring communicate by vocalizing, and pigs can determine the identity and arousal state of individuals by listening to each other’s voices. Pigs use their keen sense of smell to identify fellow pigs, determine each others’ state of sexual arousal, and even detect each others’ emotions during aggressive encounters. They use their snouts to root, to carry, and to push items, as well as to interact with each other. Pigs’ ability to differentiate each other, part of what is termed social cognition, provides evidence that pigs are as socially complex as other intelligent mammals, including primates. This capacity forms the basis for all pig social relationships, including the establishment of dominance hierarchies. Dogs can discriminate between barks recorded in different contexts from the same individual, and also from different individuals in the same context. Elephants are well known for their sophisticated recognition of other individual elephants even over long distances. Pigs have the ability to discriminate between individuals, even closely-related individuals, by smell and by auditory cues, a finding that suggests pigs vocalize in ways unique to each individual. In one study, sows listening to the calls of piglets responded more strongly to the vocalizations of their own offspring than to unfamiliar piglets, suggesting pigs can tell each other apart by vocal cues alone. Pigs can also differentiate between familiar and unfamiliar humans. This capacity to tell the difference between members of another species may indicate that pigs have significant cognitive flexibility. While dogs can tell individual humans apart and read some human facial expressions, pigs, who—unlike dogs—were not selectively bred for human companionship, can distinguish between humans by differences in body size and some facial aspects. In one study, young miniature pigs were handled gently and fed treats for five weeks. They were then put in a Y-shaped maze and were free to approach either the gentle, generous handler or an unfamiliar human. Results of the study showed that the pigs could tell the difference between the handler and the stranger by following a range of cues that relied on their senses of smell, sight, and hearing. Surprisingly, smell appeared to be the least useful sensory tool during this study. The ability to take the perspective of another individual is considered a complex mental capacity that may form the basis of a specific kind of social cognition known as Machiavellian Intelligence, which is defined by such political maneuvering as deceit and manipulation. Perspective-taking is also associated with other sophisticated cognitive capacities, including self-awareness, theory of mind—the ability to perceive another individual as possessing a mind that differs from one’s own—and empathy. As an example of likely perspective-taking, pigs are particularly adept at taking into account what their peers know and can see when they are in competition for food resources. In one study of pairs of pigs, one was shown the location of hidden food and the other was not. When the two pigs (informed and uninformed) foraged for food, the uninformed pig was able to exploit the knowledge of the informed pig by following him to the food source and displacing him. In a follow-up study, pigs that had been exploited in this way altered their behavior to avoid being exploited again. These experienced pigs were more inclined to go to the food source when they were likely to arrive before potential exploiters. In another study, experienced pigs increased their foraging speed to stay ahead of exploiters. Such behavior may be comparable to those of other perspective-taking animals, including chimpanzees and Western scrub jays, both of whom show similar strategic and counter-strategic behavior in competitive foraging situations. Pigs demonstrate their emotional connection to one another through emotional contagion, the arousal of emotion in one individual when witnessing the same emotion in another. Pigs are even sensitive to the visual perspectives of humans. They can use human head cues, for example, to tell the difference between a human who is paying attention to them and a human who is not. If pigs are so sensitive to the attentional state of others and can take the perspective of rival pigs in a competitive situation, how self-aware are they? The mirror test is one of the few direct measures of sense of self in animals. Subjects are anesthetized and marked on parts of their body, indicators which they cannot feel on their skin or see without a mirror. After animals awaken, they demonstrate mirror self-recognition (MSR) if they use the mirror to touch and explore the newly marked part of their body. Great apes, dolphins, elephants, and magpies show convincing evidence of MSR. Other species, such as macaques, dogs, and pigs, may use the mirror to find hidden food but do not use the mirror to investigate themselves in any demonstrable way. Presumably, these animals comprehend something about the relationship between their own body, the mirror image, and the food. In one mirror experiment, piglets showed signs of a precursor to self-awareness known as contingency-checking: repetitive movements at the mirror to see if the image is doing the same thing as one’s body. Usually, animals that show contingency-checking go on to demonstrate MSR. Therefore, indications of possible pig MSR are intriguing. If subsequent tests are more conclusive, pigs will join an elite cognitive nonhuman group. If not, their behavior still shows they understand something about themselves in relation to their environment. In either case, pig responses in these initial mirror studies hint that they possess a sense of self akin to that of other intelligent animals, such as monkeys. Pigs have even been trained to play video games. In one study, pigs manipulated a joystick with their snouts to move an on-screen cursor. Despite the visual and physical challenges required by this task—pigs rely on their snouts for many actions, but not typically to play with a joystick—all the pigs figured out how to use the joystick to obtain an on-screen target. Pigs even outperformed dogs in this task. Manipulation of a joystick to acquire a target indicates the beginnings of a complex capacity known as self-agency, the ability to recognize actions caused by oneself versus those controlled by someone else. Chimpanzees and monkeys are also good at performing similar tasks. Besides intelligence, our review of the literature found abundant evidence for emotions and personality in pigs. Anyone who works closely with them can attest to the anecdotal evidence that pigs are sensitive and emotional characters that do not lack for personality and, dare we say, charm. One of the ways pigs demonstrate their emotional connection to other pigs is through a phenomenon called emotional contagion, the arousal of emotion in one individual when witnessing the same emotion in another. To many scientists, emotional contagion may represent a building block for the more complex cognitive process of empathy, the ability to feel the emotional state of another. In one study, researchers housed pigs in groups of six and trained two pigs from each group to anticipate food (a rewarding event) or social isolation (an aversive event). Two pigs from each group were trained to associate the music of Bach with food, and two others learned to associate a military march with social isolation. The music was played to two other pigs (“naïve” pigs) without any positive or negative association. 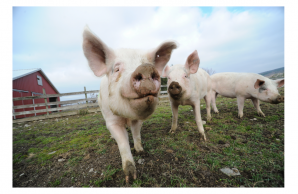 When researchers played the music to the pigs in a group setting, a few of the trained pigs showed anticipatory responses in the form of either “happy” behavior, such as play and tail-wagging (yes, pigs wag their tails! ), or stress behavior (standing alert, laying their ears back, urinating, and defecating) depending on which music they heard. When a naïve pig was near a trained pig that acted stressed after hearing the marching music, the naïve pig also became more alert and laid her ears back. The contagion response was stronger to negative emotions than to positive ones. 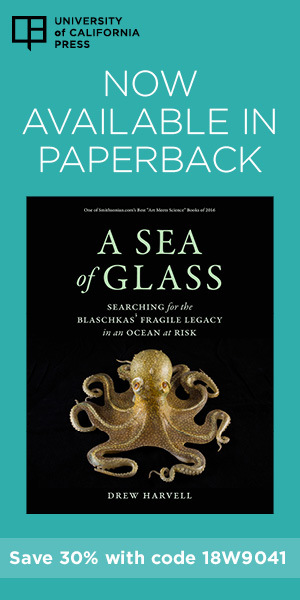 From an evolutionary point of view, it makes adaptive sense to be more attuned to threats than positive experiences. When music was played to naïve pigs when they were apart from their group, it had no effect on their behavior. Clearly, the naïve pigs responded to the emotions of the trained pigs as they anticipated either a positive or negative situation. Pigs can take into account the perspective of other individuals when in competition for food resources. The ability to assume another’s perspective is considered a complex mental capacity. Personality studies of pigs are important for understanding what traits pigs share with other species, as well as for better understanding individual variability in cognitive performance. Studies of personality in nonhuman animals have shown that personality traits are ubiquitous in the animal kingdom; a wide range of fish, birds, and mammals show persistent individual differences that can be organized along core personality characteristics, many of which overlap with those found in humans. But personality is articulated in different ways depending upon the species being assessed. In the case of pigs, we found that the language used to assess personality traits depended on the context of the study. 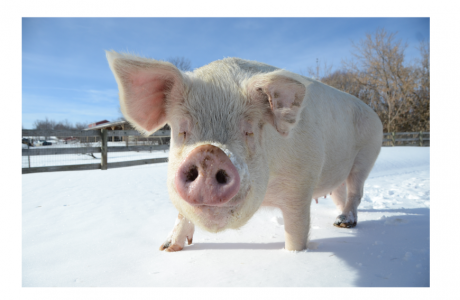 Studies that frame pigs as agricultural commodities use such terms as “coping style” or “temperament,” while authors interested in the basic comparative psychology of pigs were predisposed to the notion that pigs possess personality traits. Taken together, we found that across the literature there is evidence for at least three personality factors in pigs: sociability, curiosity, and aggression. These characteristics correspond to human dimensions of agreeableness, extraversion, and openness. All of these studies point to the presence of stable individual behavioral traits that reveal a sophisticated cognitive profile in pigs. But comparative studies of pigs and their psychology currently trail behind research on such species as dogs, elephants, dolphins, and chimpanzees. We started this research with two goals. The first was to summarize our current understanding of pigs from the scientific literature and catalyze new basic, non-invasive research. The second was, and is, a bit loftier. We want scientists and nonscientists alike to use this research to place pigs in a new light as animals worth studying and considering on their own terms—to find out who Nikki and Rose really are.